Total Length (in): 157.4 in. 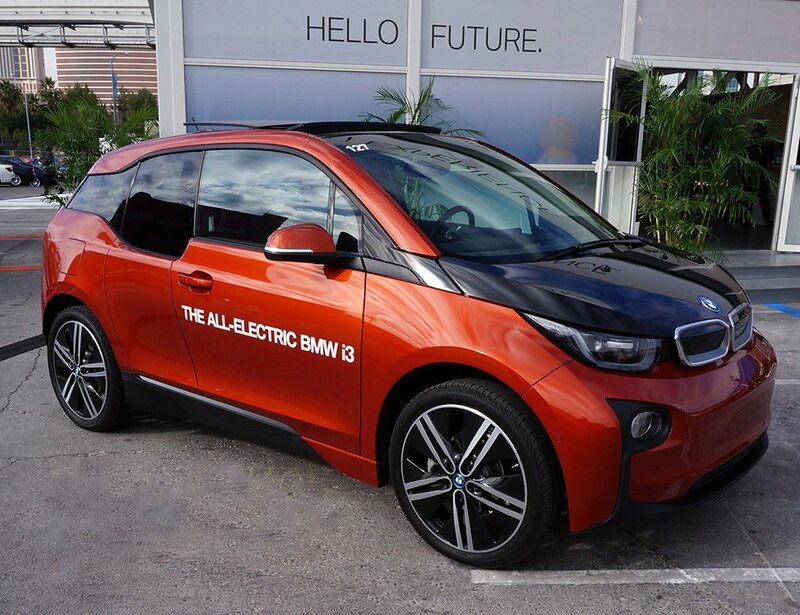 During the recent 2014 International Consumer Electronics Show (CES), I had the opportunity take BMW’s new i3 electric vehicle for a spin, and thought I’d share some of my experiences here. 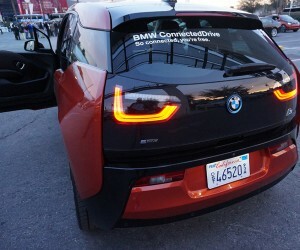 For starters, the BMW i3 looks like no other vehicle on the road. I’d say it’s just a hair smaller than a Nissan Juke, but it’s got a look that’s distinctly Bimmer, and there’s not a sharp edge to be found outside or in. 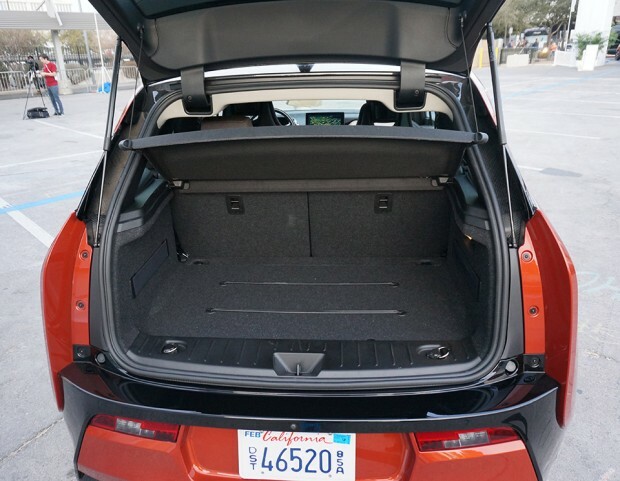 The vehicle has a compact footprint that’s capable of carrying four occupants, and has an all-electric drivetrain that can provide up to 100 miles driving range under optimal conditions. 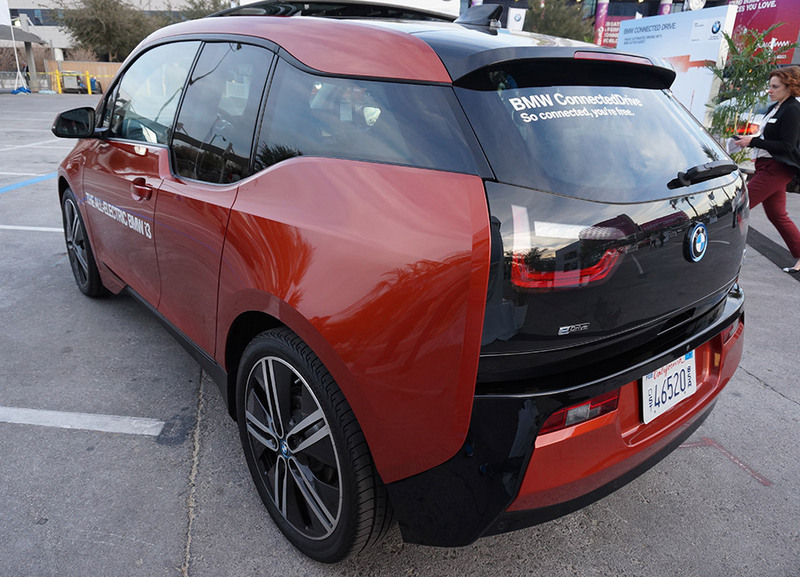 An optional gas-powered range extending generator can push total driving range up to about 200 miles, though the i3 isn’t really designed for long trips. 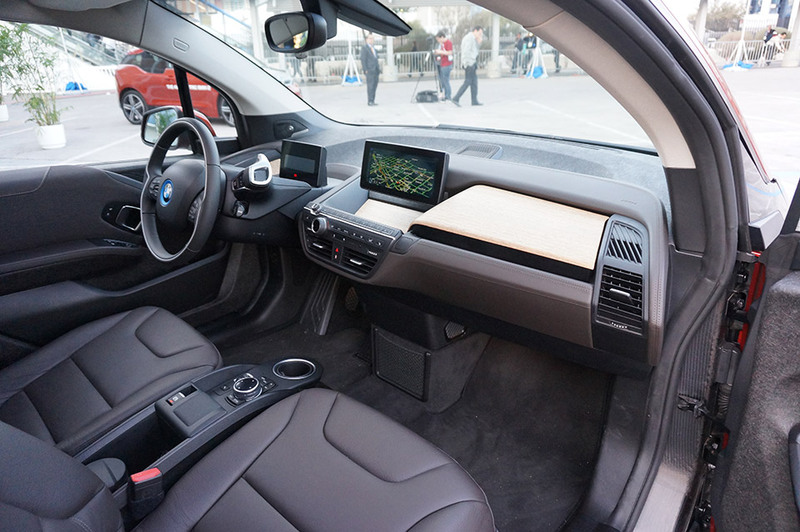 And while I didn’t get to test charging time, BMW claims the i3 can be charged to 80% capacity in about six hours using a conventional power outlet, or as little as three hours with a 220V/32A charger, like the BMW i Wallbox Pure. A full charge should take about four hours. 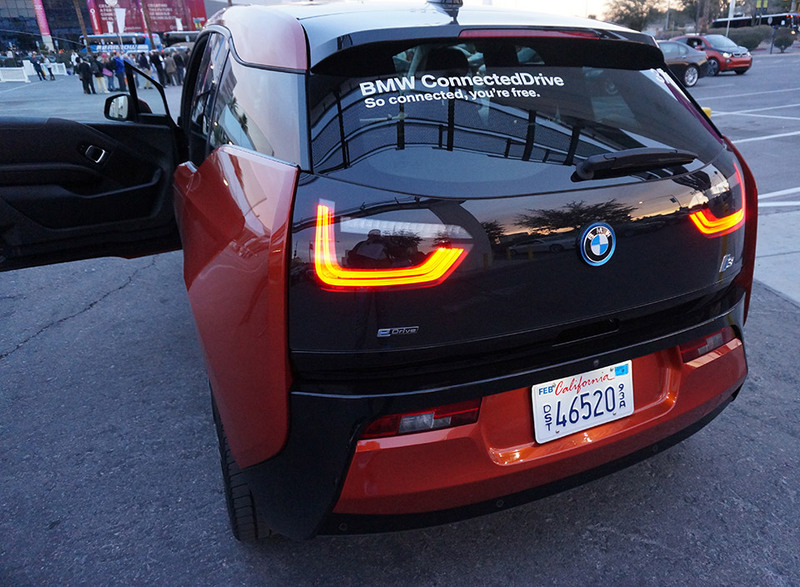 While my drive was short, and in a busy urban setting, I found the i3 to be very comfortable and deft at maneuvering through stop-and-start rush hour traffic. 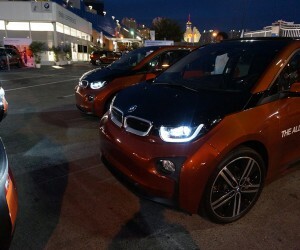 Especially notable is the i3’s zippy acceleration, thanks to the on-demand torque afforded by electric motors. 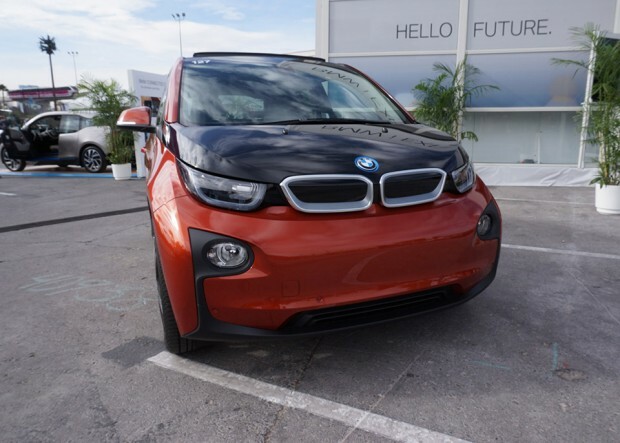 While it may only do 0-to-62mph in 7.2 seconds, it sure feels more responsive than gas engines with a similar amount of horsepower – an estimated 170hp in the i3’s case. Also of note is the regenerative braking which not only recovers energy when you take your foot off the accelerator pedal, it means you can speed up and brake with the same pedal – though you still use the brake pedal to come to a full stop. 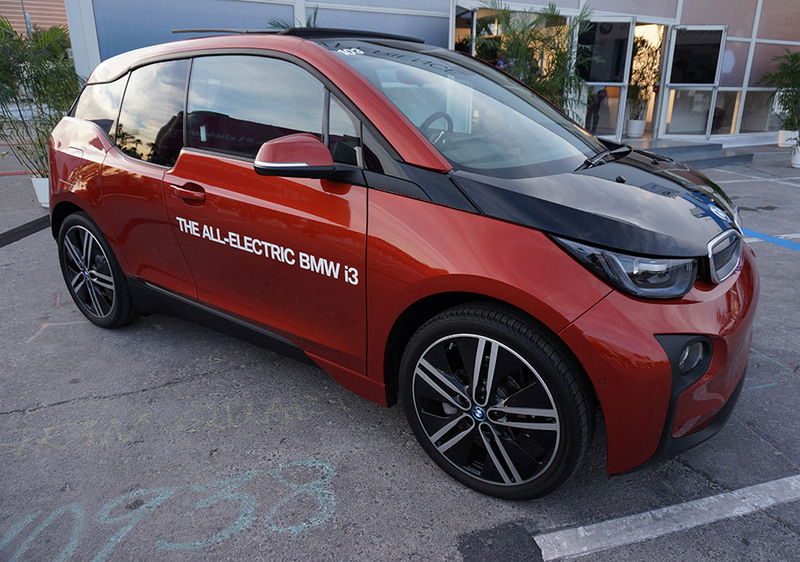 I also was impressed with the tight turning radius of the i3, making it ideal for urban locations, and maneuvering in and out of tight spaces. 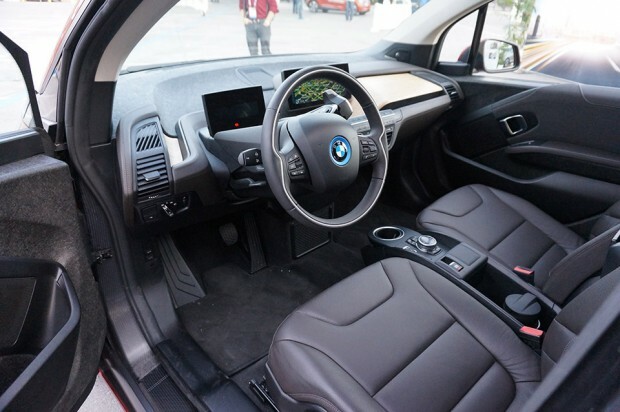 Up close and personal, I was really pleased with BMW’s use of unconventional, eco-friendly materials for the vehicle’s construction. 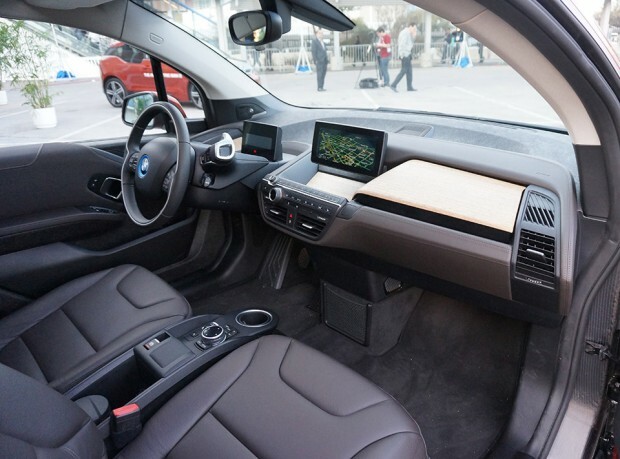 For instance, its dashboard is accented with a stunning large slab of sustainably-harvested eucalyptus wood – devoid of conventional sealants and stains, which means it will age uniquely in each vehicle. Door and instrument panel trim is made from plant-based material, exposed CFRP can be seen in the door sills, and even the elegant leather seats in my test vehicle were naturally tanned using an olive leaf extract. Driving controls are well-placed, though it takes a few seconds to orient yourself to the shift control, mounted on the right of the steering wheel, and operated by flipping it forward or backwards. As the i3 is a pure-electric, the only gear options are Drive, Park, Neutral and Reverse, and I rather like how the start/stop button is located directly adjacent to the shift control. In lieu of a traditional instrument panel, a small TFT panel is located on the steering column, which provides at-a-glance information on speed, driving range, and trip information. 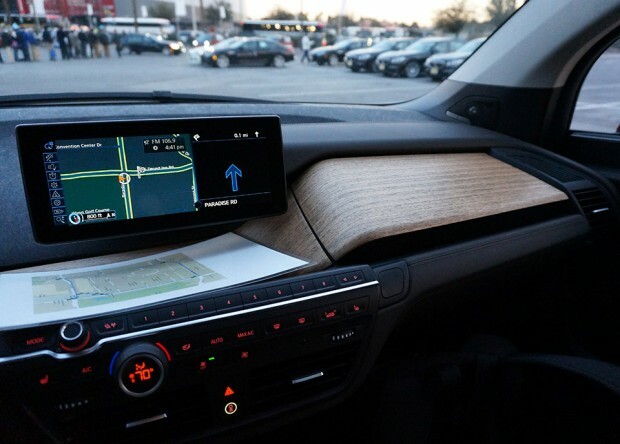 From this vantage point, you’ll also see how impressive front visibility is – the i3’s windshield seems to go on forever. 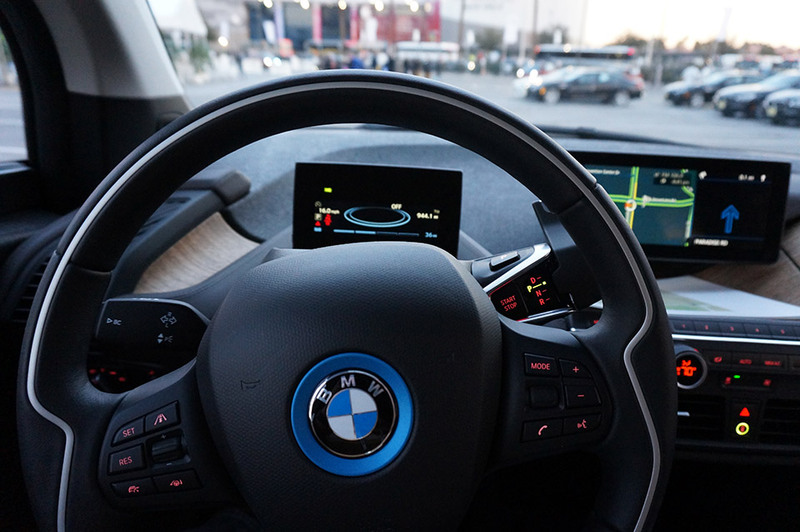 A large, widescreen display in the middle of the dash provides navigation, traffic and entertainment information, while climate control is accessible via thoughtfully-placed tactile controls, including a temperature knob which display the target temp. 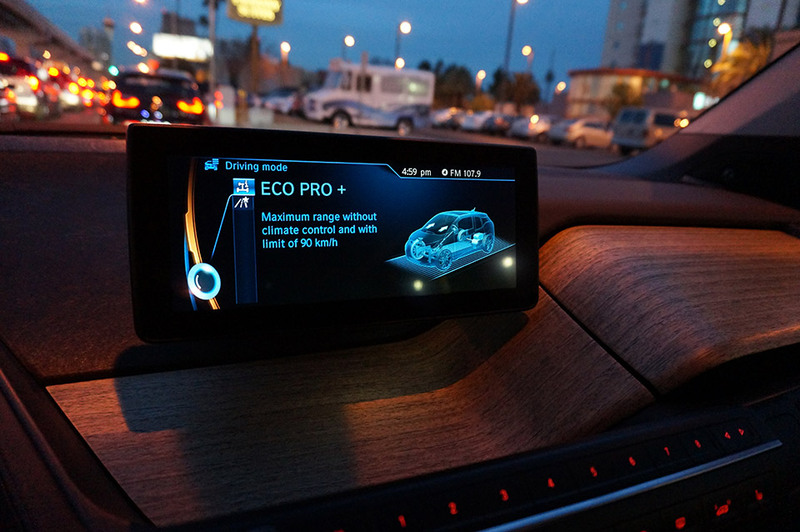 The display also provides useful information on the vehicle’s various power-efficiency modes, and backup camera display among other things. 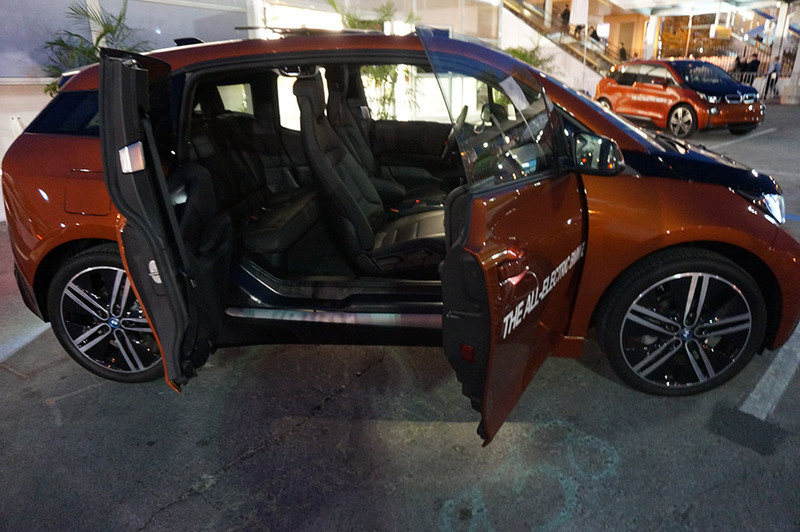 The passenger compartment is thoughtfully laid out, with a unique door configuration that looks like a two-door at first glance, but acts as a four-door. The front-seat has full length doors, while the rear row has a half-length doors which open backwards. Since there’s no “B” pillar, this results in a large open area when both front and rear doors are open. Also, since there’s no transmission or driveshaft, the floor is nice and flat, making it easy to slide from driver to passenger side if you ever need to. 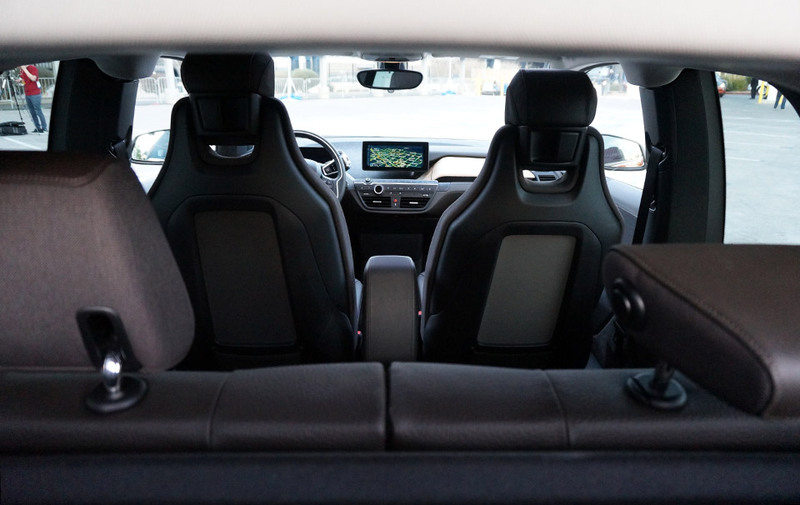 The rear of the i3 affords a reasonable amount of space behind the seats, certainly enough for groceries, small luggage, pets, or especially bad children. 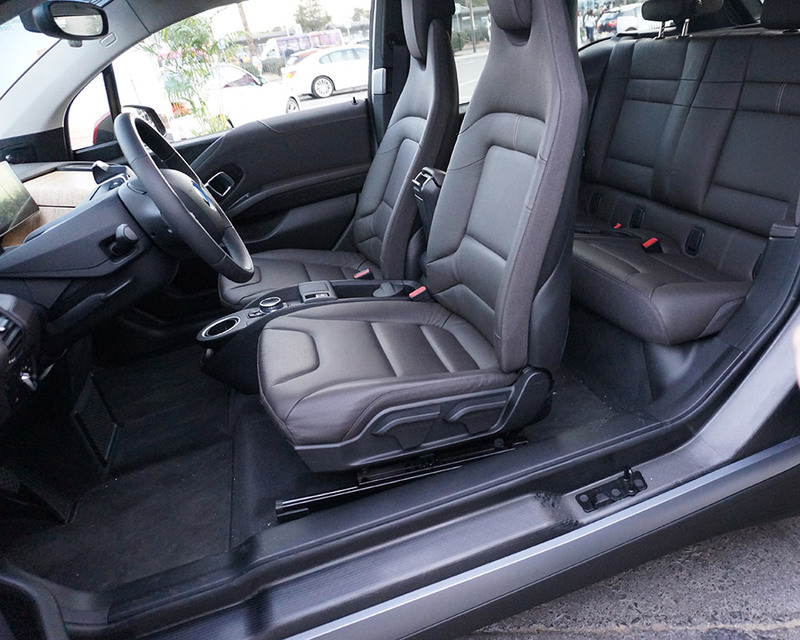 The split-folding rear seats and built-in tie-down straps make carrying longer items like golf clubs or skis a snap too. 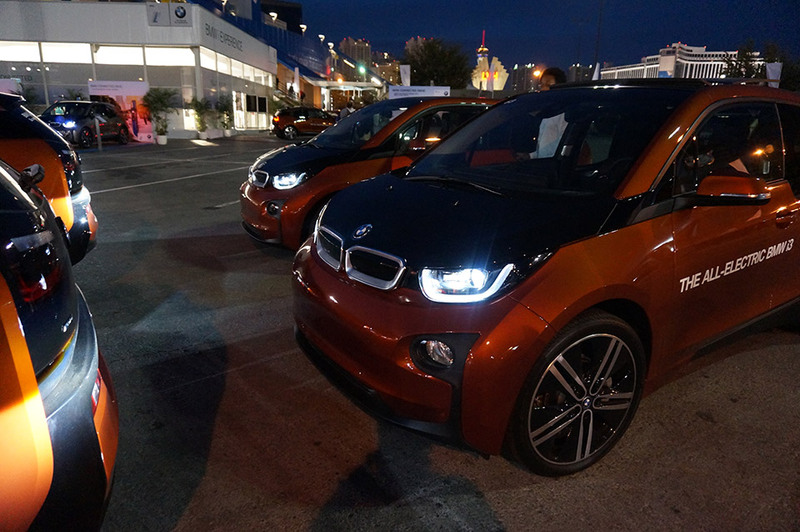 Pricing for the BMW i3 is expected to start at $42,275(USD) here in the U.S., and it’s expected to hit dealerships sometime this spring. 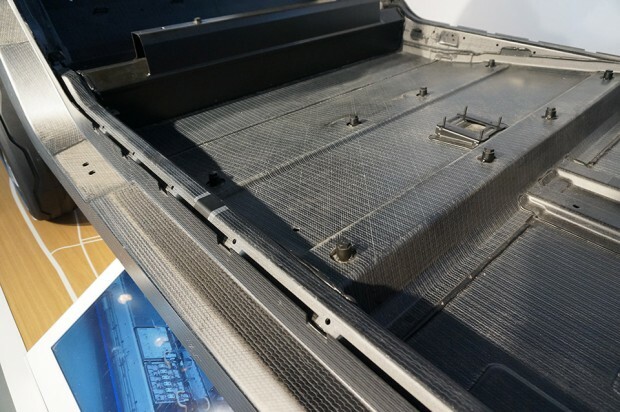 The extended range generator will add $3,850 to the price. Keep in mind that you should be able to achieve several thousand dollars in government tax incentives to offset the cost of the vehicle and charger as well. 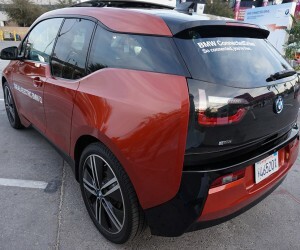 Overall, I really liked this little car, and other than the Tesla Model S, it’s my current favorite all-electric. 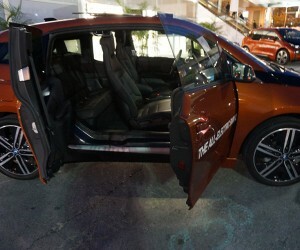 That said, it’s definitely designed for urban environments and short-haul daily drivers due to its range constraints. Still, it goes more nearly three times the distance of a Chevy Volt without sipping a drop of gasoline, and that’s a good thing. 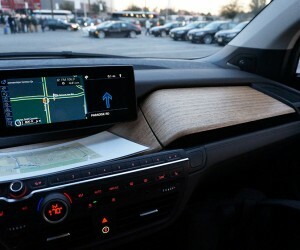 Plus, BMW’s holistic eco-conscious viewpoint on not only energy, but construction materials is welcome. 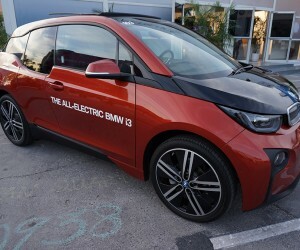 I’m looking forward to getting more time behind the wheel of the i3 down the road so I can test the range and charging experience, and see exactly how well it performs over a longer period of time.